Head-to-toe glitter might be a little much. But a little bit of sparkle never hurt anyone! 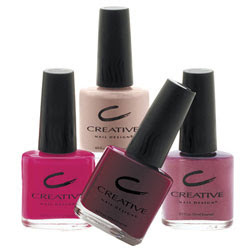 And luckily, mega-nail brand Creative Nail Design has gotten in on the action with their latest sparkly shade, Pulse. The deep fuchsia hue is accented by an absolute abundance of glitter in all colors of the rainbow, from glimmering gold and shimmering silver to glistening green and iridescent ivory. The result is a twinkling, blazing shade that looks absolutely amazing for a big night out. With only one coat, your nails go instantly from drab to fab! This shade is just perfect for those god-awful work holiday parties you can't get out of -- at least your nails will give you something to smile about all night. And the greatest gift of all? It's only $6 and available at goindulge.com. So what are you waiting for? Shine on!